What follows is a whole lot of computer geekery. Up until about a week ago we had 4 computers in the apartment. One is a desktop box I'd put together myself, using some new parts (motherboard, CPU, the important stuff) and some parts from an old computer I'd put together, the remains of which are now in the closet. That computer currently runs Ubuntu Linux as its only operating system. The second computer is a white MacBook that I bought for my girlfriend and which she loves. The third is an old Avertec mini-laptop with Windows XP that my girlfriend bought, only to discover it ran like crap, was slow as hell and crashes constantly. Once I bought her the MacBook I took that computer, installed Ubuntu Linux on it and now it runs much better. I use it mainly as a writing computer, but also as a computer I can just have lying around the house. 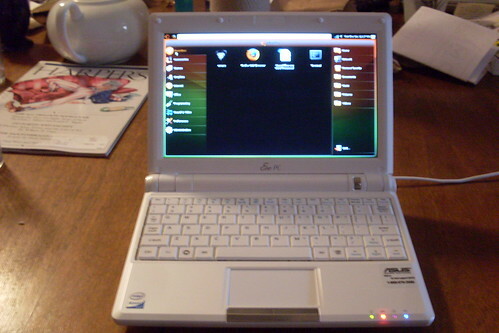 The forth computer was the Toshiba tablet PC running Windows XP that I use in the media-center setup I describe here. I got it two years ago and change and it was great for a while, and the novelty of having it convert to a tablet was pretty neat. However, Windows, in almost any of its flavors, is just not a stable operating system, and its been showing its age. For the past week or so I've been bringing it to a client to work and it's crashed two times a day. Which, for a computer professional, is just kind of embarrassing. A co-worker suggested I reinstall Windows. My reaction is why should I have to reinstall Windows? Why can't it just be stable, like, you know, Linux or Mac OS X. This little baby came running Xandros Linux, weighs 2lbs and cost about $280. 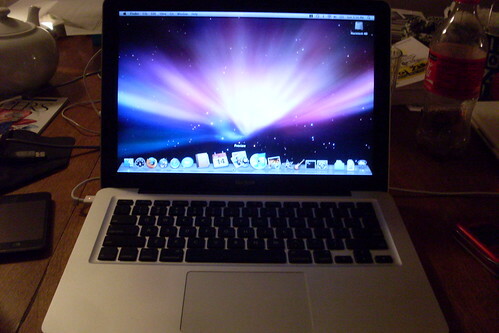 It came with 4GB of hard drive space, which for a writing computer is plenty and it's solid state which means you can drop it without worrying about the HD crashing. Or, it would be plenty except the Xandros installation (including--gah--a complete second copy of the OS in a hidden partition, for recovery purposes) takes up 95% of the HD, and then after you install the recommended updates it's over 99% and that's when the computer stops working right, the screen blacking out and the whole thing becoming unusable. Ugh. So, naturally, I wiped out the OS and installed Ubuntu Eee on it. Now it works beautifully. Why the Asus company uses this crappy version of Linux when the Ubuntu version is freely available is beyond me. And now I have a bunch of stable, solidly built computers that I can rely on and that don't have anything to do with Windows. Though I'll still use the Toshiba as a media center, at least for the time being.